Have I mentioned that I'm a Food Network junkie? I think I watched three hours of Food Network tonight while catching up on some bills and internet time. Aside from triple D, I caught a couple new shows such as Cutthroat Kitchen. I like that they're exploring new show formats, but the two new series I saw didn't really work for me. I'll stick to my Top Chef and Chopped. Now if only I could only figure out how to cook! Are you ready for another new Hare Polish? 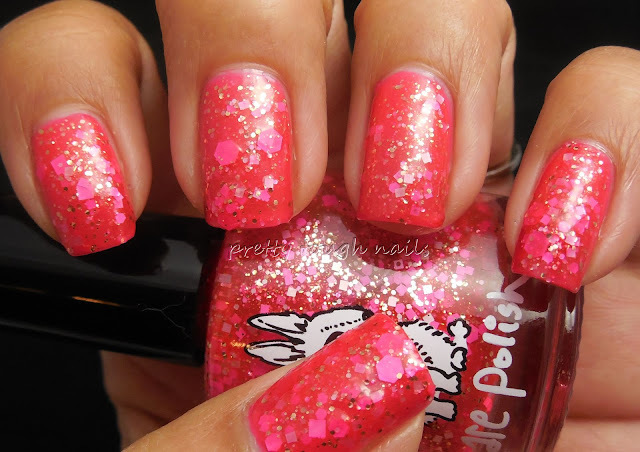 Today I have for you Dancing Bird Of Paradise, a jelly glitter with a hot pink base. 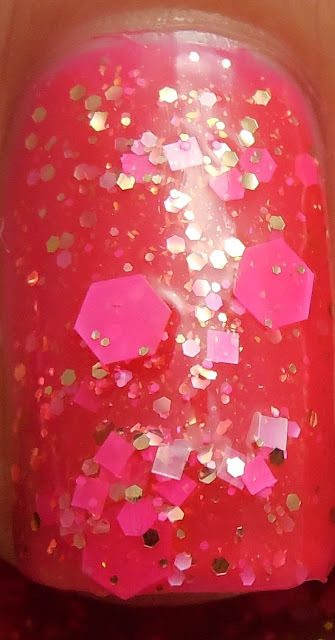 From my last Hare Polish review, I realized that these may be better layered over a colored base to minimize overloading on glitters, so for this Hare I used New York Summer Hot Magenta, a hot pink jelly base. This was fairly opaque for a jelly, and I used two thin easy coats for these pics with no topcoat. There's still some visible sheerness but this will be covered up later with the Hare. Now for the star of the show, Dancing Bird Of Paradise. Did I mention how I love Nikole's play on words and combining two phrases into one name? DBoP is a pink jelly based glitter polish showcasing different sizes and shapes of matte pink glitters and mini gold hex glitters. I love the giant hex glitters and had no trouble getting them out of the bottle. No clumping of the glitters here either, unlike the last Hare - maybe because there aren't as many matte glitters, and because I didn't use as many coats. I finished this with layer of Essence Gel Look Nails and NYC GCS. I love how this turned out! By using New York Summer Hot Magenta I didn't sacrifice depth but managed to get lots of color in the base. The pretty pink is perfect for summer and the gold and white glitters really play well off the hot pink. 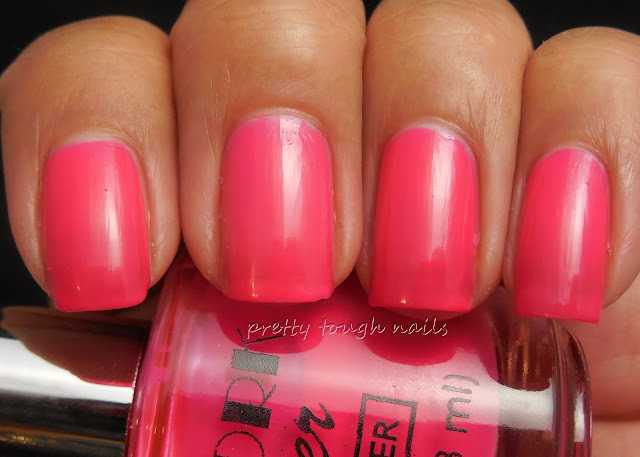 I don't quite see the "Dancing Bird Of Paradise" but I can see a dancing pink flamingo when I look at this polish. This is definitely pink that I plan on wearing again and again. Is this a pink that you can wear? Love this! It almost looks like a slight gradient. It does, doesn't it?? I wish I could pull off a gradient that well! Beautiful manicure, great layering choice! I am afriad of large glitters like those big hexes but they looked perfectly integrated on your nails. I was a little worried with the large hexes too but I didn't try to do anything special with these and they all seemed to fall naturally into place. Gotta love that! This is gorgeous! I definitely need to get some of these new Hare polishes. Lemmings, lemmings, lemmings... there's about a dozen collections out there that I would love to have too!